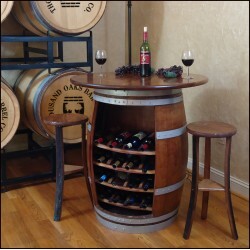 Barrel Credenza made from a real wine or whiskey barrel. .. Le Cache Contemporary Credenza - Classic Cherry (P/N 879). Clean, contemporary design blends equally.. Le Cache Euro Credenza - Chocolate Cherry (P/N 756). Designed by acclaimed, Pinnacle Award-winning d..
Vinotheque Basic Credenza 3 Door Dbl (P/N 7579). These cabinets are styled with full-length glass do..